Enjoy Breakwater Beach without the hassles. Your private cabana awaits. Relax and enjoy the kid-friendly water park, without having to worry about standing in line for lunch or finding a chair on a busy day. Cabanas MUST be booked in advance (48 hours) online prior to your arrival. 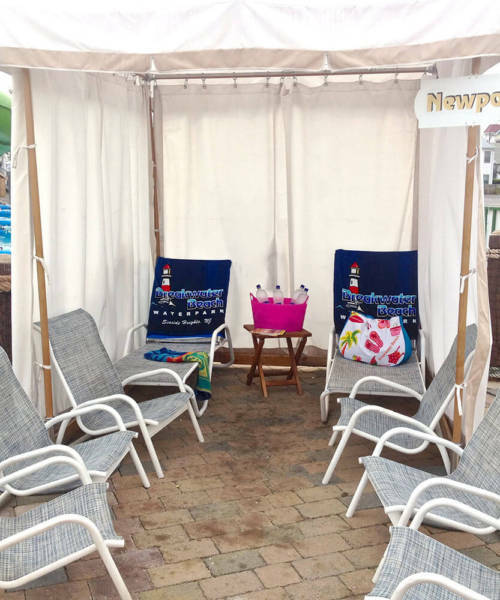 First come, first served - limited cabanas available. MUST BE BOOKED 48 HOURS IN ADVANCE ONLINE. All cabana guests should enter at the main ticket windows and receive their wristbands. Once inside the park you should proceed to Guest Relations to be escorted to your cabana. All cabanas must be booked in advance (48 hours) prior to your arrival. Includes 2 lounge chairs, 2 regular chairs and a small table. Includes above PLUS additional eating table and chairs with private sunny sitting area. 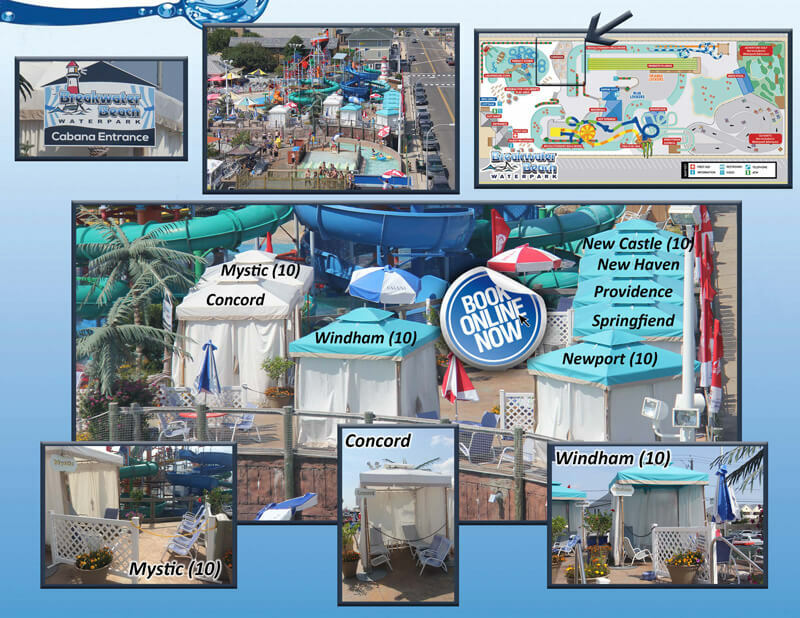 Please note that waterpark admission is NOT included with Cabana Rental. Admission into the waterpark is a separate charge. Food, drink and gratuities are not included in cabana rental fee. Cabanas MUST be booked in advance prior to your arrival. First come, first served - limited cabanas available. Cabanas are located up a set of stairs. A handicap accessible 6 person or 10 person Cabana is available. The handicap accessible cabana can only be booked by calling Guest Relations. For reservations, please book online by clicking the link below. Cabana reservations are final. We do not offer refunds. NO Refunds and/or rescheduling will only be offered in the event the park closes for the day due to inclement weather.